We dressed up the kids, faced the downpour and the puddles and survived the sugar high. But now, with Halloween behind us, it's holiday time! Thanksgiving is only a few weeks away and things are about to get busy. We want to give you a head start on your holiday wardrobe and get you party ready. Thanksgiving tends to be on the casual side here in Portland, it's often jeans with a cute top or cozy sweater and a some statement jewelry. We've stepped it up a notch, by eliminating the denim, but the styles remain easy to wear, comfortable, and of course, chic. 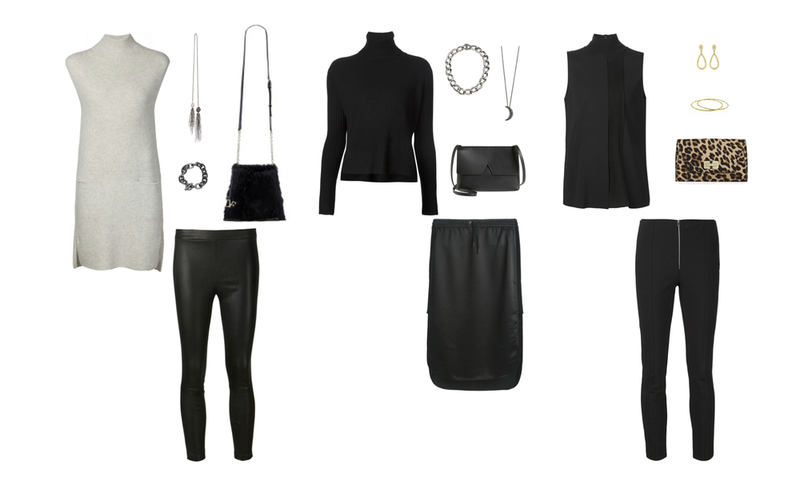 From L to R: Vince directional rib cashmere dress and stretch leather leggings, Samira 13 tassel pearl lariat, Rene Escobar oxidized silver bracelet, DVF fur cross-body, Frame "Le Crop" cashmere turtleneck, T by Alexander Wang skirt, Rene Escobar oxidized silver necklace, Sara Weinstock half moon pendant with diamonds, Vince "Signature V" cross-body, Vince laser cut sleeveless turtleneck, Rag & Bone "Perry" pant, Sara Weinstock yellow gold and diamond earrings and bangles, DVF leopard print clutch. We've kept the palate neutral, and the fabrics forgiving (it is Thanksgiving after all) and added some exciting accessories.